Diarrhoea. 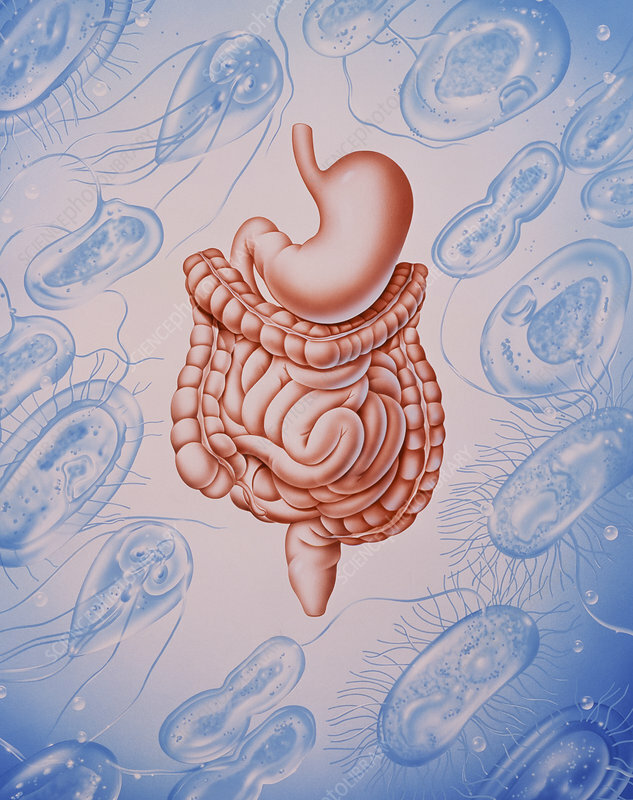 Artwork of the human digestive system surrounded by some of the microorganisms that can cause diarrhoea. The digestive system is made up of the stomach (at upper centre), and the small intestine (lower centre) which is surrounded by the colon. Diarrhoea normally affects the colon which is responsible for absorbing water from liquid food as it turns into faeces. Food poisoning can lead to bacterial infection of the colon by Salmonella, Clostridium or Staphylococcus leading to acute diarrhoea. The protozoan Giardia lamblia (seen at top left) can infect the small intestine; it causes giardiasis leading to violent attacks of diarrhoea with foul smelling faeces.